A high quality alcohol based aerosol combining sanitising and air freshening properties. 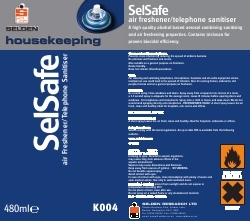 Cleans and sanitises telephones. Prevents cross infection by reducing the spread of airborne bacteria. De-odorises and freshens sick rooms. Also suitable as a general purpose air freshener. Ozone friendly. Does not contain chlorofluorocarbons. For cleaning and sanitising telephones, microphones, headsets and all audio equipment where multiperson use could lead to the spread of infection. Also for nursing homes, sickrooms, care homes and as a general purpose air freshener. As a room spray. Close windows and doors. Spray away from occupants into corners of a room, a 3-5 second spray is adequate for the average room. Leave l0 minutes before opening doors and windows . For telephones and instruments. Spray onto a cloth or tissue and wipe clean. We do not recommend spraying directly onto telephones . RECOMMENDED USAGE: A short spray leaves the air fresh, clean and healthy. Ideal for hospitals, sick rooms and offices. Composition Perfume carried in an alcohol base.